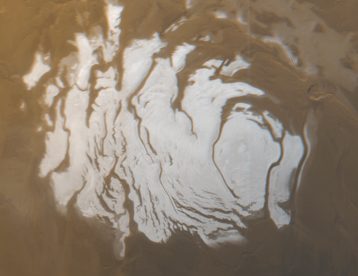 This is the south polar cap of Mars as it appeared to the Mars Global Surveyor (MGS) Mars Orbiter Camera (MOC) on April 17, 2000. In winter and early spring, this entire scene would be covered by frost. In summer, the cap shrinks to its minimum size, as shown here. 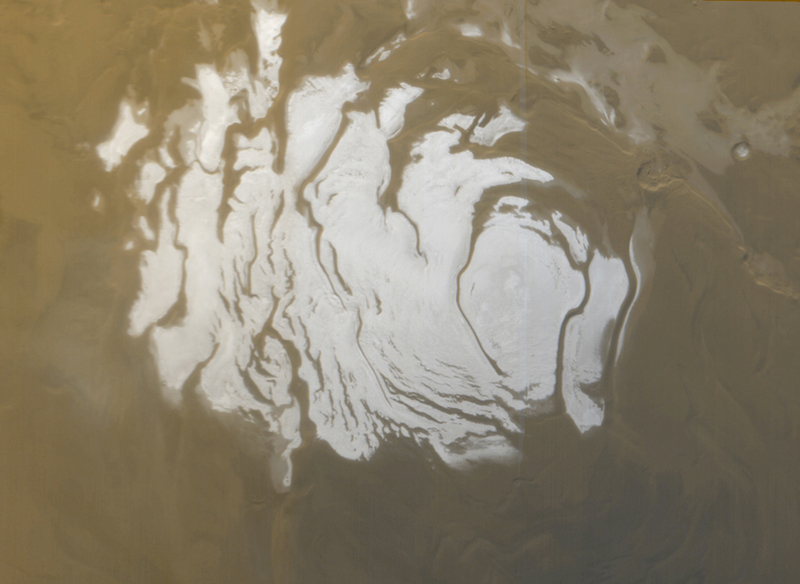 Even though it is summer, observations made by the Viking orbiters in the 1970s showed that the south polar cap remains cold enough that the polar frost (seen here as white) consists of carbon dioxide. Carbon dioxide freezes at temperatures around -125° C (-193° F). Mid-summer afternoon sunlight illuminates this scene from the upper left from about 11.2° above the horizon. Soon the cap will experience sunsets; by June 2000, this pole will be in autumn, and the area covered by frost will begin to grow. Winter will return to the south polar region in December 2000. The polar cap from left to right is about 420 km (260 mi) across. CLICK HERE for Full Resolution View (940 KBytes).